To release the full flavors in every fresh roasted bean there are a couple of things to keep in mind. First, while most coffee experts agree that the Vacuum Pot produces the best coffee, the more widely available French Press is arguably just as effective. To help you unlock the full flavor potential from your fresh roasted Hockley Valley Coffee, consider the following home brewing tips. Using a French Press (Also known as a Press Pot) is one the easiest and best ways to get truly excellent coffee at home. The key to getting great results are: using fresh, high quality beans; grinding the coffee correctly; using clean equipment and timing the process. You’ll need a French press, fresh whole beans, a grinder, a wooden spoon, a timer and cups. It is important that the coffee be ground coarse and ground with a quality burr (rather than a blade) grinder. By grinding the coffee coarse, you’re allowing for a slower and more even extraction, which results in a fuller bodied and more nuanced cup. Blade grinders chop the coffee rather than grinding it, resulting in uneven particle size and unpredictable particle size. This results in uneven extraction, which causes coffee to increase in bitterness, which is not true to the authentic flavor profile of the bean. You’ll need half an ounce of coffee for every 6 to 8 oz of water. In other words, if you have a 16 oz press you’ll want to use about an ounce of coffee. If stronger coffee is desired, feel free to adjust this amount based on your own personal taste. 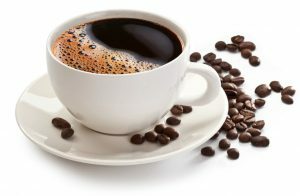 If weaker coffee is required, add boiling water to your cup of coffee. Make sure the pot and filter are clean and dry. You should bring water to a boil and then let cool for 20 or 30 seconds. First, soak the grinds thoroughly with a little of the boiling water, and then pour it aggressively into the pot so that it agitates all the grounds. The key is to saturate all of the grounds evenly. You should move the stream around as you pour to help with this. Do not fill the pot entirely. With fresh coffees you will see significant expansion of the coffee in a sort of foam at the top of the liquid once you add water. This is known as bloom and is the result of the off-gassing of CO2 from the coffee (hint –when you don’t see a large bloom chances are your coffee is stale). Ideally, the mixture is allowed to soak for 4 minutes. It’s beneficial but not critically important that you use a timer to ensure that all the natural flavours emerge from the fresh roasted ground beans. Add the lid and be sure to align the opening in the plunger lid with the spout of the pot. You should push the press (slowly) into the pot to force all grounds to the bottom. You might need to press and then release and repeat this step. Do not crush it with all your might use some finesse. Grounds that are allowed to sit too long will take on a bitterness that is inherent in every bean from over extraction. You need to pour your coffee as soon as you have pressed the pot. 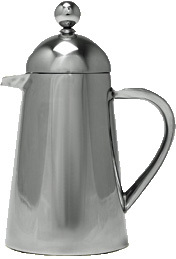 If you’re making more coffee than you want to drink right away, pour the coffee into a thermal carafe. Do not leave the coffee in the pot it will quickly degrade in quality. Swirling some piping hot water in your carafe to pre-heat it will help keep your coffee hotter longer.